A Mother's heart journeys through a lifetime of experiencing both joys and sorrows along the way. We carry the banner of love, understanding, wisdom gained, and a hope. What more can this Mother of three beautiful treasured daughters write about this special design. If you are familiar with this center pendant,"Born in Your Heart," then you already know about the healing and beauty that our amazing child's drawing has given to our family and the world. She was only 5 years old and new to our family when she would be carrying a burden to heavy for herself. She had questions that I could not satisfy with my answers. I believe that God gave her a visual gift and then she drew her Born in Your Heart from that. It certainly is a beautiful and masterful drawing that has touched me deeply. She had defined our love and "Motherhood." You can read more about that here: http://goo.gl/H9jGns : Since that time of her drawing, we have been building a collection that gives back 30% of the proceeds to orphan care. By the grace of God, we were able to provide a fresh water well for a village ( read here: http://goo.gl/FQJwaZ) and now medical equipment for her sister's orphanage(http://goo.gl/RjnGPU) . We are looking forward to where God leads us next. We added a circle around the hearts to represent eternity. Our hope is NOT with earthy things....it goes beyond. We love that you can build your own Mother's Heart just the way you want it. It becomes your story. A beautiful and personal memory of your family. One that you will delight in sharing and passing down. We hope that you will enjoy the awe, beauty and passion of her Born in Your heart, " A Mother's Love." "A Mother's Heart" sits in the center of this necklace surrounded by the birthstones of your choice. You can add them now and get more later too. The stones are beautiful 6mm Swarovski Crystals. 316L high polished stainless steel . Gift bagged with an inspirational story card. 16" adjustable to 20". Great wearing flexibility in adjusting size and includes a Born in Your Heart designer 12mm tag that hangs from the back. A generous portion of our retail sales will be donated back to provide for the needs of orphans around the world. 3. 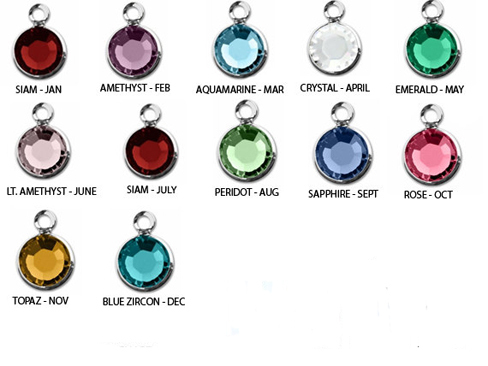 If you want your birthstones put on in a particular order, please leave us a note during check-out in the note section.